I am used to juggling a lot of balls in the air so having this many projects (of the crafty-kind) on the go at one time is really no surprise. It was good to take a few moments today to review what was “in-progress”. I actually forgot about my shawl, I’m excited to get back to that! 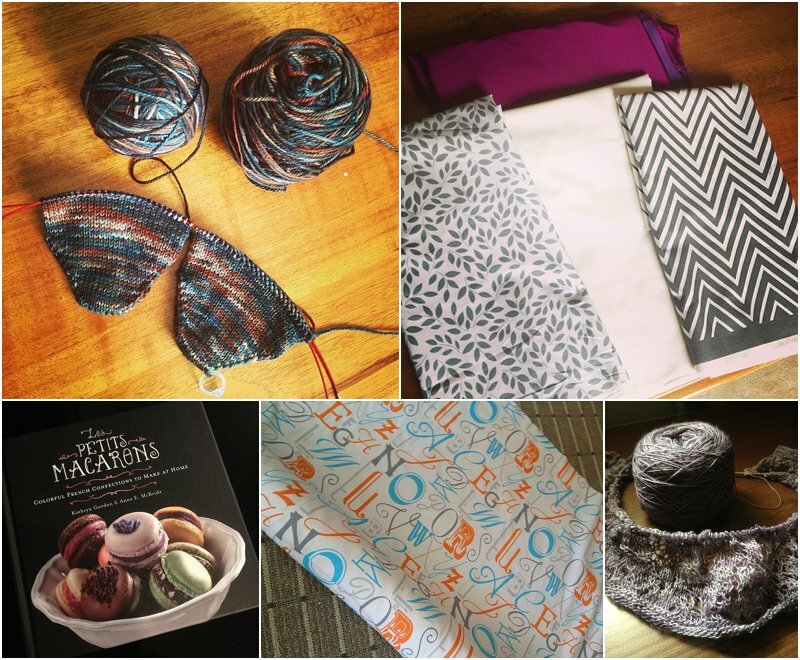 How many projects and crafty-things do you usually have on the go right now? What are your WIPs? 1) Classic toe-up, two-at-a-time socks. Yarn from indigodragonfly – it’s a beautiful 80% superwash merino, 10% cashmere, 10% nylon blend in their MCN sock weight. The colour is called “Chipmunkadelic”! 2) Fabrics ready for washing. I’m making two adorable little girls dresses using the adorable Geranium pattern. 3) My first lace-weight shawl. I love this pattern so much. It is a major endeavour but I hope I do eventually finish it. 4) This fabric came from Tonic Living. The end result will be some curtains for work that will hide a storage area in the communications room (get it, letters… communications room). 5) And no to-do list of mine would be complete without some baking. I ordered this book recently and can’t wait to start making some petit macarons (just like the ones I had at a specialty bakery in NYC last fall). Looks like a wonderful weekend!! Isn’t indigodragonfly dreamy?! Would you believe three pairs of socks? Laura – from you, yes! 🙂 Road trips are the best for getting these projects well underway. Still jealous of your yarn find!